The heat is rising. As California battles another round of wildfires, and 2018 continues toward becoming one of the hottest years on record, a new study predicts that in the coming decades the United States' heat problem will grow more dangerous and expensive. Even under the best-case scenario, the new study suggests a warming climate will drive thousands more people into emergency rooms across the country and could cost tens of millions more dollars in treatment by 2050. The study's authors looked at how many people visited emergency rooms for hyperthermia, or overheating, in 136 metropolitan areas in the U.S. between the summers of 2005 and 2012, and projected how the number of ER visits for hyperthermia may increase under different climate scenarios. The study was published in GeoHealth, a journal of the American Geophysical Union. If little is done to lessen greenhouse gas emissions, the authors claim U.S. emergency rooms could see 28,000 more hyperthermia visits annually by 2050, which could cost roughly as much as $52 million. Extended to 2090, the annual number of visits for hyperthermia could increase by up to 65,000, costing up to $118 million. Even under the most charitable climate scenario where emissions are restricted across the globe, ER visits for hyperthermia in the United States could still increase by 21,000 by 2050, costing up to $38 million. Under this scenario, by 2090 hyperthermia visits could increase by up to 28,000, costing up to $52 million. No matter the emissions levels, the study suggests, U.S. hyperthermia visits and the incurred costs will climb. By spelling out the consequences of climate change in terms of human health, lead author Claire Lay and coauthor David Mills of Abt Associates, a research-based consultation firm, hope to frame the conversation on climate in a way the general public can better grasp. "The broader goal of this work is to move conversations from the impact of climate change in physical measures like degrees or watts of warming, to impacts that people are more familiar with, like health-based outcomes," Mills said. "It's another way to say, 'here's what climate change could mean for you.'" The study follows a sweeping, multi-agency report exploring the impacts of climate change on human health, published by the U.S. Global Change Research Program in 2016. 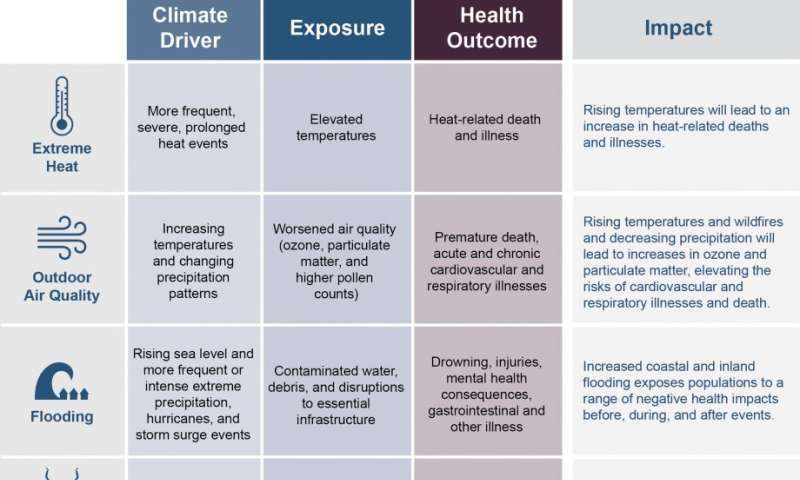 That assessment identifies which groups are most at-risk of dying from extreme heat, projects increases in heat-related premature deaths, and determines that even small changes in seasonal average temperatures can kill, among other findings. The USGCRP report focuses largely on the direct health impact of heat on death, not on heat-induced illness and its costs. 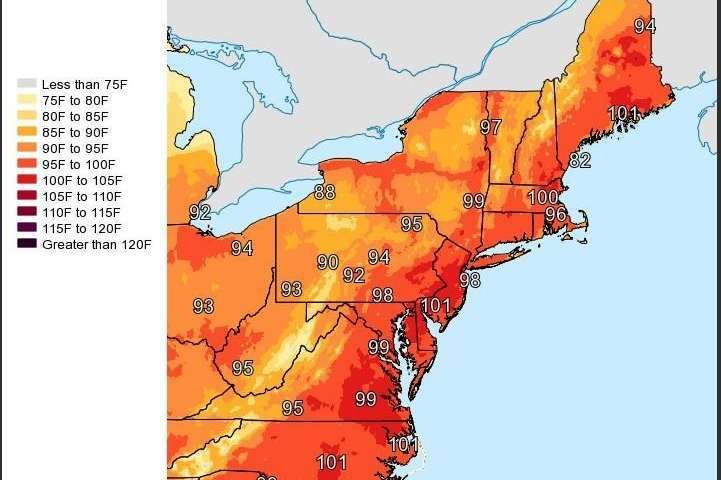 The new study explores heat's cost on health by focusing on hyperthermia admissions, and projects the coming change across much of the country's metropolitan areas. "We found that the human cost and actual expense of increased emergency room visits adds up—even for a straightforward effect of increased temperatures like hyperthermia," Lay said. "This paper helps add to the story regarding health issues we may see increasing in the next 50 or 100 years." In the new study, Lay and her co-authors used private insurance data on the number of emergency room visits for people aged 64 years and younger who have employer-based health coverage in 136 major metropolitan areas in the United States. They identified the relationship between daily temperature and the number of people who had gone to emergency rooms for hyperthermia during the summer, and projected similar visits into the future under different climate scenarios. They estimate that by 2050, an additional 21,000 to 28,000 people in the United States could visit the emergency room for hyperthermia each summer. This could cost between $6 million and $52 million, depending on how well emissions are mitigated, the cost of individual visits, and how well communities adapt to climate changes. By 2090, visits might increase by 28,000 to 65,000, costing between $9 million and $118 million. Because the records exclude the elderly, those who live outside metropolitan areas and people without employer-based coverage, the authors suggest their estimations are conservative. Hyperthermia can cause organ failure and even death if left untreated. Many of the chemical processes that keep the human body functioning healthily occur within a narrow temperature range, and exceeding that range can kick off serious symptoms. "You don't want to end up in the ER with hyperthermia," Mills said. "It's extremely serious. To get admitted and discharged for hyperthermia means you walked a very fine line between life and death. You may be fine, but there is also a chance you could have some pretty significant long-term health impairments."